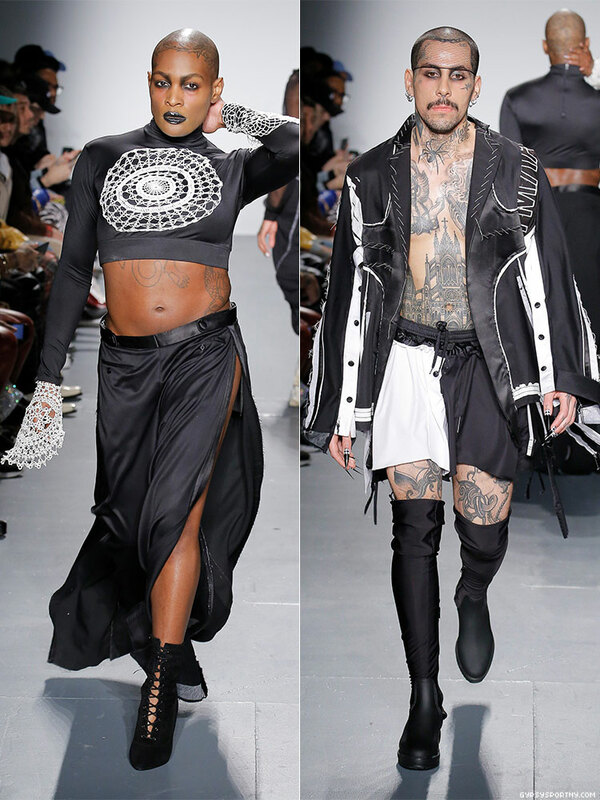 Gypsy Sport's Fall/Winter 2018 collection is composed of black and white pieces and reflects the binaries of that divide people today. Known for its bright colors and bold prints, Gypsy Sport strays away from its own norm in this collection to show the limitations of varying binaries including gender, race, and politics. In an exclusive article for them., Uribe stated that to push the nonbinary idea into reality, he wanted a high fashion photo campaign that referenced 90's supermodel glam with only queer and nonbinary models. For the black and white shoot by photographer Oscar Ouk, Uribe and casting director Anthony Conti went on to cast drag queen Nina Bonina Brown, child drag star Desmond is Amazing, androgynous model Jazzelle Zanaughtti, drag queen West Dakota, artist Kyra Cherie, model Kelvin Dupres, Bermuda, and Z.